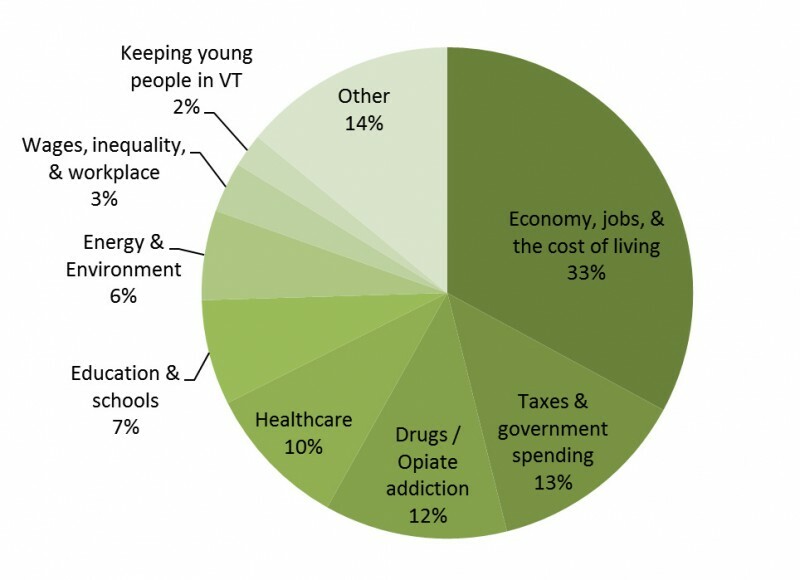 As is generally the case, jobs and the economy are seen as the most important problem facing the state of Vermont. The recent Castleton Poll found one-third of all respondents citing the economy as the most important issue facing the state. This is the issue most on Vermonter’s minds. Figure 1 illustrates the range of responses to this open-ended question. Included in the “other” category were a wide-range of responses that touched on concern for the state’s infrastructure, abortion, partisanship, and concern for the state’s senior citizens. While in total they represent a large number of respondents (14 percent), no single issue within this group overall represents more than 2 percent of the total sample. 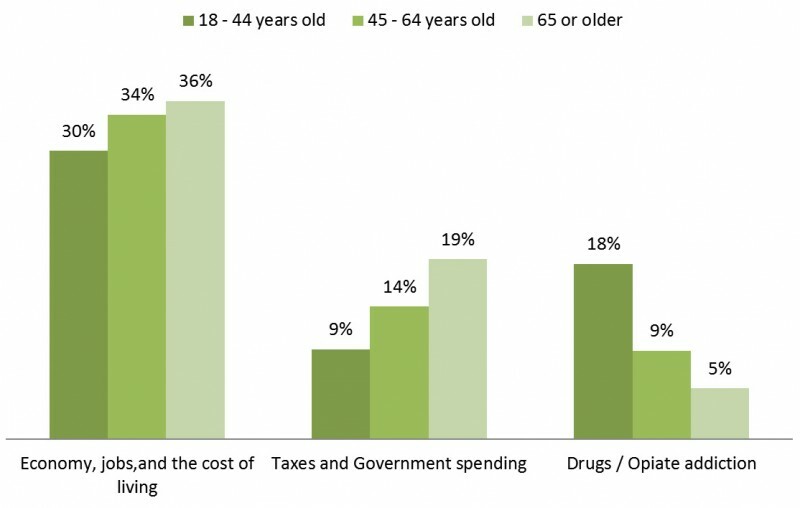 The economy and taxes and spending were more likely to resonate with older respondents, while drugs and opiate addiction as an issue was more likely to resonate with younger Vermonters; Figure 2 illustrates these difference. The economy is seen as more salient as one’s level of education increased, and conversely, taxes and spending is seen as less salient as education levels rise. The Castleton Poll asked respondents, “The Vermont legislature passed and Governor Shumlin signed Act 46, a law designed to encourage and help local school districts partner together to create districts of at least 900 students. How familiar are you with Act 46?” Given the brief introduction to the question, 12 percent said that they were very familiar with Act 46, and 48 percent said they were somewhat familiar. Forty percent of Vermonters are completely unfamiliar with Act 46. Regardless of familiarity with Act 46, a clear majority (59 percent) favor state actions to encourage consolidation of schools. There is no clear relationship between respondents’ familiarity with Act 46 and their support of state actions to consolidate schools. There is also little differences in support for school consolidation by political party affiliation or by one’s level of education; however, age appears related to ones views on the issue; 54 percent of those under 45 years old support consolidation, compared with 61 percent of those age 45 to 64, and 65 percent for those age 65 and older. Right now, Vermont state government is considering whether or not to establish an independent panel to investigate potential ethics violations where state officials are involved. Would you support or oppose the establishment of a state ethics commission in Vermont? Some have argued that as a small state, Vermont does not have the problems of other states, and therefore an independent ethics commission is not necessary and would only be a bother. Others have argued that Vermont needs an independent oversight body to address concerns about the ethical behavior of public officials. With whom do you most agree? The first question asks about support without concern for the degree to which respondents feel such a commission is necessary, while the latter question measures respondent’s sense of need for such a commission in Vermont. 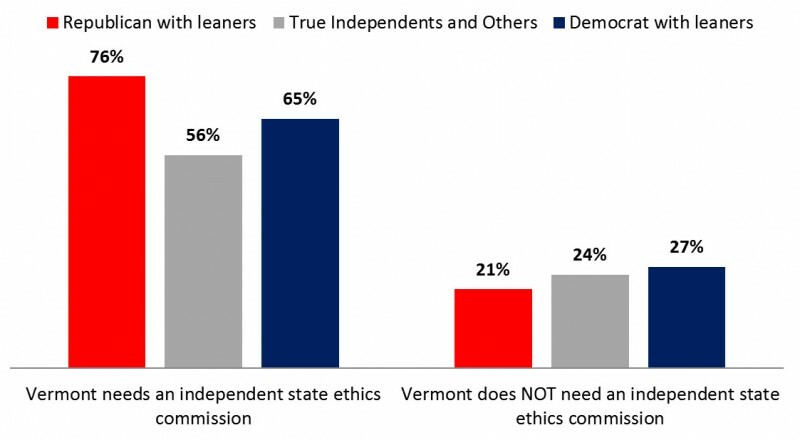 This experiment was done because it possible that Vermonters would support an ethics commission even if they thought there was little need for one. There is both support for the establishment of an ethics commission (74 percent, n = 302) and a perceived need for such a commission (67 percent, n=315), both with large majorities. 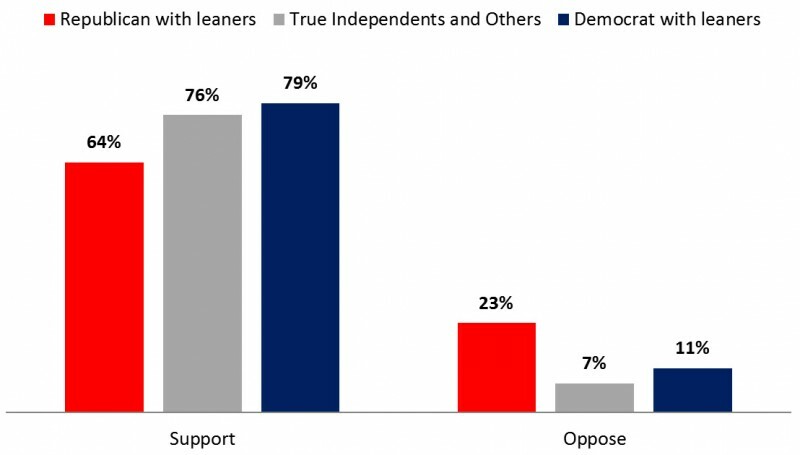 Ironically, the perception of need is highest among Republicans, and the support for the establishment thereof is highest among Democrats. These differences are illustrated in the following two figures. It is possible that Republican perception of need for an ethics commission as well as their reluctance to support such a commission have the same root: trepidation about government and governmental solutions. The opposite may explain the Democratic higher support level and lower sense of need for the commission. Support for legalizing and regulating marijuana if Vermont for recreational use has remained steady since the last time that Castleton put the question to the general public. In February 2015, a Castleton Poll found a slim majority (54 percent) favored and 40 percent opposed legalizing marijuana; in the poll that just concluded September 14th, we found 56 percent favor legalization and 34 percent oppose. The percent without an opinion on the matter rose slightly from 6 percent to 10 percent, but this difference is not significant. Overall, support remains level even as talk about taking the issue up in the next legislation session increases. View the full table results from the poll. See the methodology details for this poll.